Pienza is an absolutely unique town, filled with romance, and it is a magical place to celebrate your Italian wedding. Zeffirelli filmed his acclaimed version of Romeo and Juliet in Pienza, no doubt choosing this beautifully preserved Renaissance gem for its outstanding architecture and its setting in the lovely Val d’Orcia valley. Pienza’s center was completely redesigned by Pope Pius II in Renaissance times, and it was seen as a ‘utopian town’ by the Italian people. It has changed little since then, with a great number of ornate, centuries-old buildings packed into a relatively small area. The town’s population is just 2,500. The town cathedral, the duomo, was designed by the architect Rossellino in 1459. Its outstanding features are huge stained glass windows, dazzling Sienese altarpieces in the chapels and 16th century tapestries in the crypt. The Papal Palace, the Palazzo Piccolomini, is adjacent to the duomo. Its apartments, which were occupied by the Pope’s descendants until 1968, are open to the public. A pretty hanging garden and arcaded courtyard lie directly behind the palace, offering spectacular views of the valley. Also in the center of Pienza is the town hall, whose architecture is Florentine in style and thus differs from the rest of the town. There are also two museums where you can discover more about this beautiful town. On the outskirts of Pienza is a Romanesque parish church that is well worth visiting. Pope Puis II, whose legacy can be seen everywhere in Pienza, was baptized here, and its doorway is decorated with intricate flower patterns. Pienza is a peaceful and welcoming town with a unique archaeological heritage. 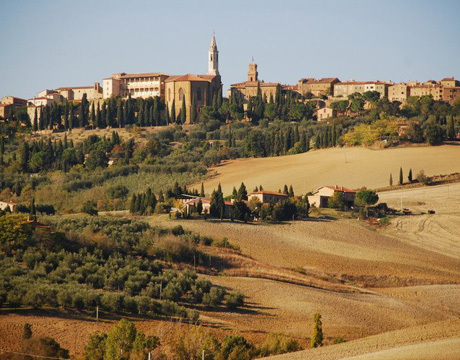 If you are looking for a quiet and romantic destination for your wedding in Italy, Pienza is an excellent choice.